On 10 July 1969 a project called Alpha Jet was started by the governments of Germany and France to cooperatively create a light aircraft for advanced jet training and for the tactical support role. The contenders were the following: Dassault-Brequet joined up with Dornier with the TA-501, Aérospatiale with MBB with the E-650 Eurotrainer and VFW with their own T-291 project. On 23 July 1970, the TA-501 project from Dassault-Dornier was selected, a tandem seat twin-engined jet trainer and light attack aircraft. Dassault-Brequet was responsible for building the front fuselage and assembly of the trainer variant as well as the export orders. Dornier in Germany produced the rear fuselage, the tail, wings and assembled the attack variants. The Alpha Jet is power by two Larzac jet engines, which were designed by Turbomecca, SNECMA, MTU and KHD. On 30 November 1972 the first mock up was accepted by both governments and a contract for the production of four prototypes. On 26 October 1973 prototype 01 made the first flight, sixth months ahead of the contract scheduled date. The official presentation flight was flown on 23 November in 1973 at Isres, France. On 9 January 1974, the second prototype made its maiden flight, followed by prototype 03 on 4 May and prototype 04 on October 11th. Alpha Jet E entered production in 1977. The first production Alpha Jet E-1 was flown at Istres, France, on 4 November 1977. The aircraft features a DEFA 30mm cannon. The German Alpha Jet A entered production a year later. Alpha Jet A was the light attack variant for the Luftwaffe designed to replace the Fiat G.91R/3s in the light attack and close air support role. The A is therefor equipped with a more advanced nav/attack system including HUD, Doppler navigation radar and twin-gyro INS. The German versions were equipped with a 27mm Mauser cannon, replacing the French DEFA. Alternatively a Super Cyclone recce pod could be carried on the centeline station. Principal customers were the air arms of the partner countries, the French Air Force taking 176 between 1978 and 1985, and the Luftwaffe 175 between 1979 and 1983. The Alpha Jet E was produced for the French Air Force and several export customers, including Egypt, where it is known as the MS1. The Arab Organisation for Industrialisation’s Helwan factory assembled 37 Alpha Jets from CKD kits between 1982 and 1985, and also produced some components under licence. The Egyptian Air Force also received eight aircraft assembled in France. 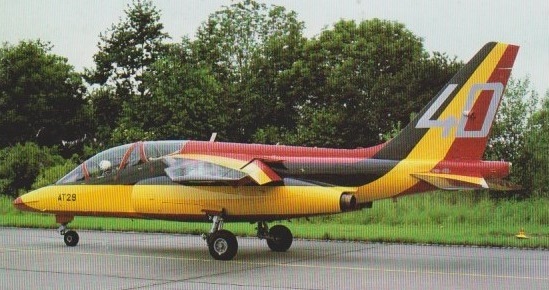 The close-support version (Alpha Jet A) was built for the West German Air Force; while the alternative close support version, with a new navigation/attack system, was sold to the Cameroon and Egypt as the M52. The Alpha Jet Nouvelle Generation pur l’Ecole et l’Appui (NGEA), now known as the Alpha Jet 2, incor-porates the navigation/attack system of the M52 together with uprated Larzac 04-C20 engines and Magic 2 AAMs. No NGEA sales have been achieved, but Egyptian M52s are to be upgraded to NGEA standard. The fifth version, announced in 1985, is the Alpha Jet Lancier. Derived from the NGEA, the Lancier is intended for day/night ground attack, anti-shipping strikes, and anti-helicopter duties. In addition to the NGEA systems it has a Flir, Thomson-CSF Agave multimode radar, active and passive ECM, anti-shipping missiles, and laser guided bombs. No orders for the Lancier have been achieved to date. The Alpha Jet 3 is an advanced training version for use with FLIR, laser and ECM systems. Under an independent programme, the Luftwaffe is retrofitting more powerful Larzac 04-C20 engines to boost performance. A limited armament and avionics upgrade had been approved for the Luftwaffe's Alpha jet fleet for service from 1992. By early 1986 more than 480 Alpha Jets had been delivered, against orders for 501 for ten customers. The German Luftwaffe was the sole operator of the Alpha Jet A light attack version until the 1990s. The first production aircraft flew in 1979 and three years later Dornier closed the production line. The 175 Luftwaffe Alpha Jets replaced the Fiat/Aeritalia G.91R, of which 300 were operated in the tactical support and light attack role. In the 1990s the Alpha Jet was slowly withdrawn from service, the last example being officially retired on 31 December 1998. A large number of aircraft was sold to other nations and about 40 aircraft were put into storage at Fürstenfeldbruck. Two examples have been bought and restored for flying with the Flying Bulls, a display team sponsored by Red Bull. The Alpha Jet E trainer version for France entered service with the Armée de l’Air replacing the Fouga Magister, Lockheed T-33 and the Dassault Mystère IVA. The Belgian Air Force needed an advanced trainer and was interested in the development of the Alpha Jet since the start of the project. Belgium operated 28 aircraft, which have been upgraded prolonging their service life until at least 2015. The upgrade was carrier out by SABCA (Société Anonyme Belge de Constructions Aéronautiques), the first upgraded example being delivered back to the air force on 21 April in 2000. The upgrade features a new flightstick, advanced HUD, GPS, ILS and a multi function display in the rear cockpit. In 1994 50 ex-Luftwaffe Alpha Jets were sold to the Portuguese Air Force. In service with Squadrons 103 Caracóis (Snails) for complementary flying training and operational conversion training and with Squadron 301 Jaguares (Jaguars) on the offensive air support role, both squadrons operated from Beja airbase. Operators: Belgium, Cameroon, Egypt, France, Ivory Coast, Marocco, Nigeria, Portugal, Qatar, Thailand, Togo. Armament: 1x MK 30mm, 2500kg ext. Engine: 2 x Snecma/Turbomeca Larzac 04-C6. Initial ROC: 3420 m / min. Range/Endurance: 1230 km / 3.5 hr. Armament: 1 x 27/30 mm, 2 x AAM.